How to Sort Recycling. As the awareness of non-renewable resource depletion grows, recycling is becoming more popular. Many people think it's a good idea in theory, but become discouraged when they realize how much effort it requires. Rather than simply throwing all recycling into one bag, as with trash, you must sort the different types of recyclables before delivering them to a recycling center. Gather all of your recyclable materials. Divide them into like groups; glass with glass, metal with metal, paper with paper. Put all magazines (anything printed on shiny paper, such as catologs, magazines, flyers, inserts or brochures) in one pile. These can all be recycled together. Gather all newspaper (no glossy ads) together in flat stacks. There will often be a bin at a recycling center marked for Newspaper Only. That is where these stacks will go. Gather copy paper (of any color), computer paper, notebook paper, envelopes, note cards, manila folders and NCR paper (carbonless forms). Staples and paper clips are acceptable, but remove book covers and plastic or spiral wire bindings. Break down and flatten boxes. Tie together larger pieces of cardboard. 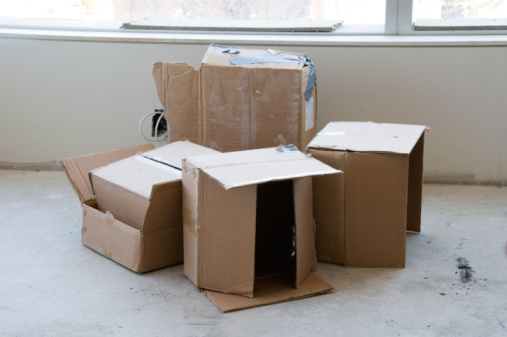 Break down smaller pieces of cardboard and fiberboard and carry in a brown paper bag to consolidate materials. Clean out all glass containers thoroughly, especially those that contained food. Gather together clear, brown or green glass, bottles and jars only. Remove lids (labels are ok to leave on). Rinse and crush cans before recycling. Put tin cans in a separate section as aluminum or be sure to remember to separate once you've gone to the recycling center. Sort plastics into groups of #1 (clear PET); #2 (HDPE milk jugs); and #2 colored HDPE (detergent bottles). There should be a marking on bottles to indicate into which group the container fits. Crush bottles as much as possible.